The 124 Spider in Abarth guise. Smile! 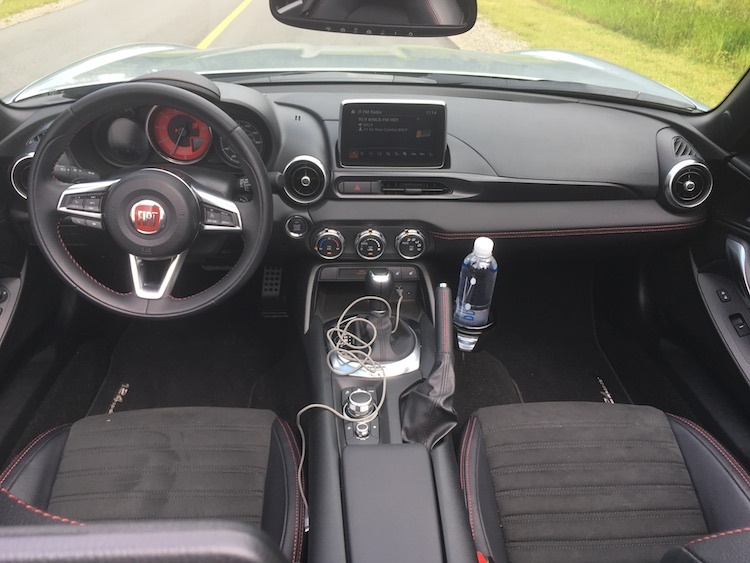 You’re going to love getting behind the wheel of this Abarth. Small car manufacturer Fiat is struggling in a market where consumers want their big vehicles. Since its return to the US in 2011, sales peaked in 2014, but have fallen steadily through the ensuing years. Some consumers, though, would do well to reconsider smaller and lighter vehicles going forward as gas prices have reached levels we haven’t seen in years. For those that have not explored the Fiat range in as many years, a fun little model joined the lineup in 2017. That model is none other than the Fiat 124 Spider, a roadster supplied courtesy of Mazda. 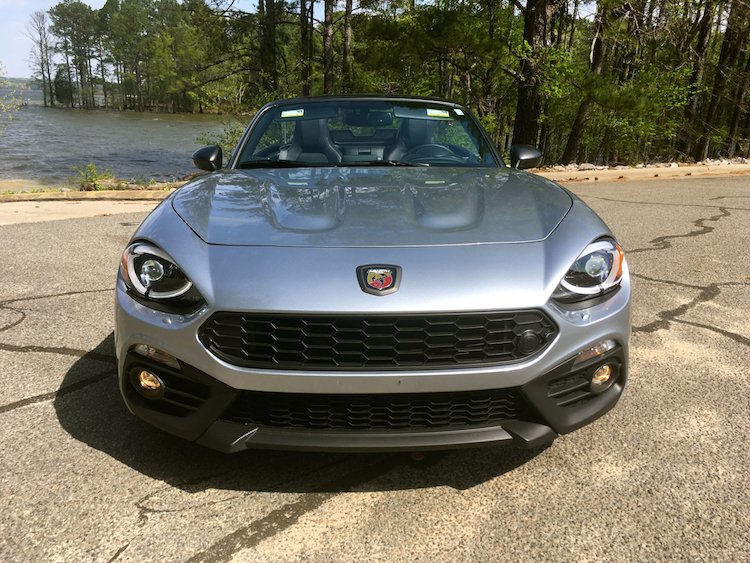 Indeed, the Mazda MX-5 Miata serves as the foundation for this sporty Fiat, a vehicle offering its own take on the roadster segment. Fiat offers the rear-wheel drive 124 Spider in Classica ($24,995), Lusso ($27,495) and Abarth ($28,195) trims. All three come with a turbocharged four-cylinder engine paired with a six-speed manual or a six-speed automatic transmission. After a 32-year absence, Fiat reintroduced the 124 Spider in 2017. Light package changes accompany the 2018 edition, which otherwise is a carryover. As for Fiat’s relationship to the Mazda, both vehicles are built at Mazda’s manufacturing plant in Hiroshima, Japan. The Fiat takes the Mazda’s superb handling and comfortable ride and adds Italian flair and turbo power. This doesn’t mean the Fiat is better than the Mazda — it just establishes its own take on the tapestry. For the record, I like both models. Very much so. You can call it a day and quit your reading right now or press on to find out a few more details about this Fiat variant. The Fiat’s canvas is small, crisp and sporty. The rounded headlamps and squared tail lamps hearken to the original model. The front fascia couldn’t be more different than the Mazda. Whereas the Miata has a pretty Japanese girl’s face, the Fiat has a tougher image, not unlike some of Europe’s finest sports cars. I’m sure I’ve offended someone by the Miata descriptor — no offense intended. The Abarth model, the very one tested, expands on the handsome theme by adding several touches unique to it. It starts with its body-colored front fascia and includes gunmetal-colored side mirror caps and roll bar cover. Gun-metallic 17-inch aluminum wheels, Brembo brakes with red covers and bright quad exhaust tips complete the look. Otherwise, all models come with projector headlamps, power side mirrors, a soft-top convertible roof and various aluminum wheel choices. Optional equipment includes fog lamps, LED automatic leveling headlamps, headlamp washers, heated side mirrors and an available red-top roof. Speaking of the roof, it is easy to drop down and pick up. You’ll do this with the car idle — simply unhook it from the inside in the middle and drop it down until you hear a click. Reverse the process by first hitting the release lever near the glove box, then move the roof into position. Once you start the process, if the windows are open, they will automatically slide half way down to avoid a potential glass-cracking catastrophe. Small touches mean big results in this Abarth edition. Inside, the cabin is well, snug. The following are four points I have pulled out covering the interior. 1. Not for tall people. If you are tall and have drooled over the Miata or the 124 Spider, you may wonder if you can fit inside. Comfortably, that is. Likely, if you are somewhere north of 6-feet-tall, this little Fiat just will not work for you. At a shade under 6 feet, I found the getting in difficult — back end first helps. The cabin is tight with very little room to maneuver. But do not take my word for it — attempt to slip behind the wheel to find out for yourself. 2. Not a square inch wasted. Some vehicles have what seems like acres of wasted space on the dashboard, but this Fiat roadster makes use of every tiny corner. It has to. it causes a few odd placements, though, including the immovable and protruding cup-holder on the passenger side. As for the driver’s drink-holder, it is located between the seat-backs in front of the glove box. Retrieving your drink takes patience and some skill as you reach over with your left arm while steering with your right. You might find wedging a bottle between the seat and door a better option. The rollover bar is located immediately behind the seats. 3. Comfortable, sporty seats. The seats are reasonably comfortable and bolstered, just as you would expect. There is no seat extender, but then movement is quite restricted. The steering column tilts, but it does not telescope. Again, room is extremely limited, which explains the restricted movement of both the seat and column. 4. An assortment of touches. The hand-brake seems like a throwback to another era. An electronic brake switch would seem like the better choice here as it would consume less room. Alas, it is not offered. The vent dials are circular as are the main controls for everything else. Further, storage is minimal, but you will find a place to tuck or stack smartphones and connect to two USB points to keep them charged. Small models are typically thin on the amenities, especially one so reasonably priced as this Fiat and its Mazda cousin. It does come with a rearview camera and offers blind-spot monitoring and rear cross-traffic alert. A rear parking sensor is also available, but driver-assist technologies are not offered. Most models come with a four-speaker audio system and Bluetooth. Upgrades include satellite radio, a 7-inch color display and HD Radio. Choose a package upgrade and you’ll score a 9-speaker Bose audio system with GPS navigation. A tangle of wires can get in the way. Two USB ports are present. 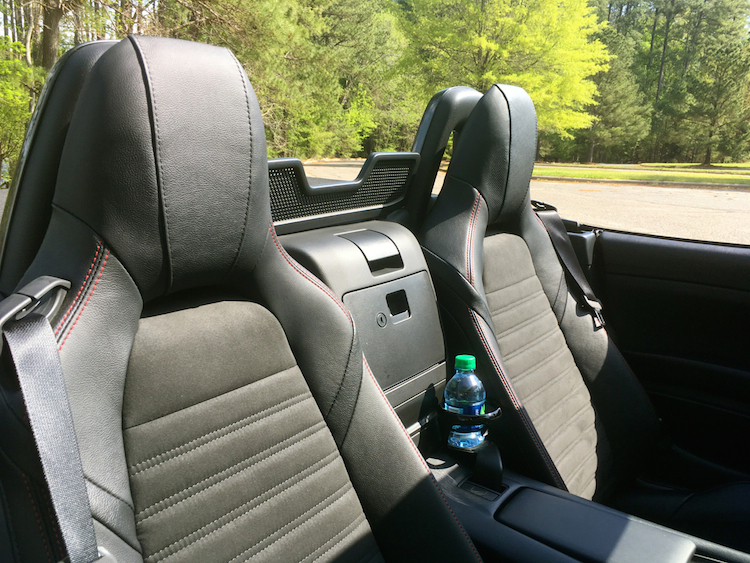 Any chance you can (especially whenever the weather cooperates) you will want to drop the top on this Fiat. 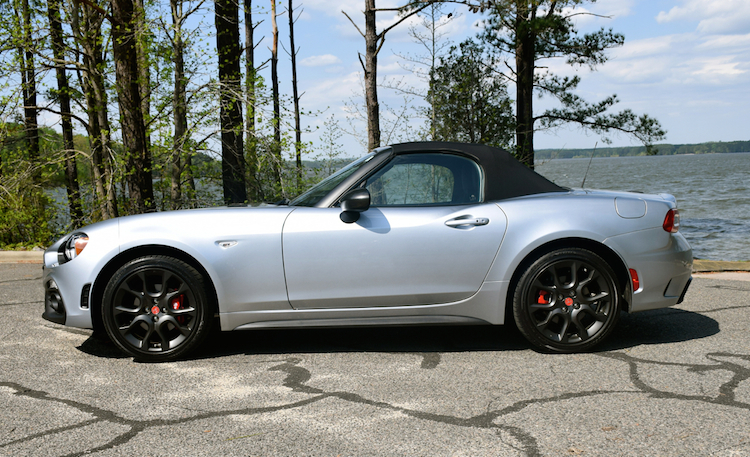 The prime reason for many to own a Fiata — Fiat/Miata — is to soak up the sun and connect with the road. 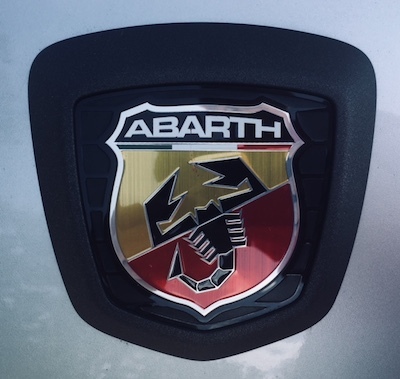 That connection is amplified in the Abarth with its humming engine and a pleasant exhaust note. The note corresponds nicely to the engine’s size — no overwrought tune to make you go hmmm…. My test model came with the automatic transmission (sigh), but I made work of the paddle shifters from time to time. The Fiat’s engine is unique to it, a 1.4-liter turbo, generating 164 horsepower and 184 pound-feet of torque. That is considerably better than the 155 hp/148 lb.-ft. for the Miata. Both engines offer an available six-speed short-throw manual gearbox. The fun continues as the Abarth enjoys a sport-tuned suspension versus the usual touring suspension. Add in a limited-slip differential for improved control and handling and you’ll see this roadster means business. Fire up the ignition and the little engine that could delivers a boomlet, while the exhaust purrs. Step-off acceleration is even, turbo lag is not a big drag and moving up to highway speeds is fun. The exhilaration begins on the twisty roads where this little roadster hugs the pavement, pushes into each turn with abandon and leaves corners with ease. 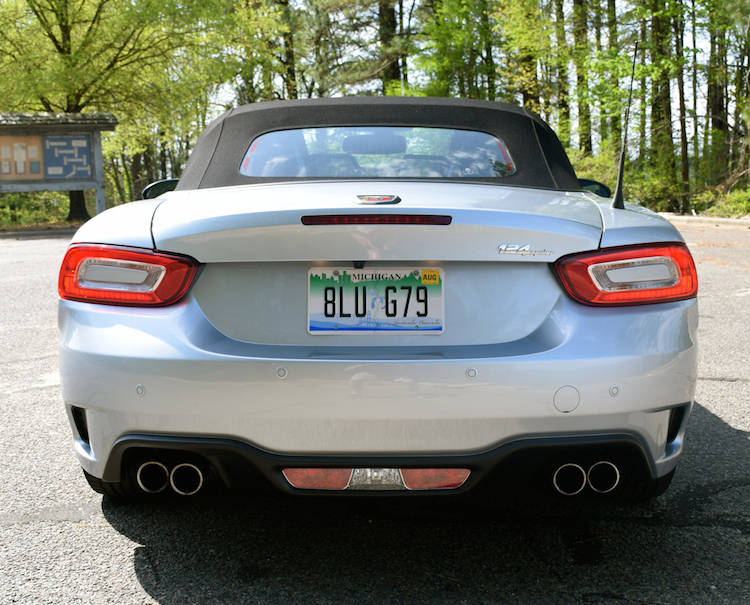 Will the 124 Spider save Fiat? No. What it does do is burnish its image. Yes, Fiat turned to Mazda to produce the model and that makes for a compromise some may find deplorable. At the same time, it shows how competing manufacturers can find a common ground — Mazda gets some cash, while Fiat receives a halo model. As for the consumer, the 124 Spider adds a wrinkle to the roadster segment, essentially creating a competitor to the Mazda. But the duo remain unique in this world, with only the hardtop Subaru BRZ/Toyota 86 offering the closest competition, especially to the Miata RF, a hardtop exclusive to Mazda. Pay more (a lot more in some cases) and the Nissan 370Z, Porsche 718 Boxster/Cayman and the Audi TT, might also be examined. It really is not a fair fight as the Fiata duo simply undercut and in some ways overwhelm the competition. 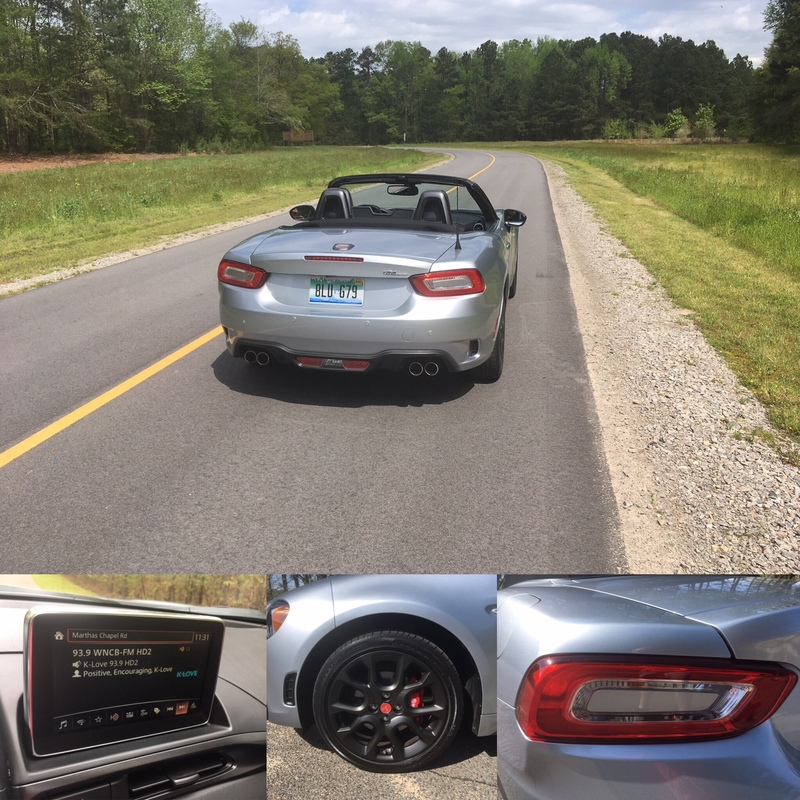 Fiat 124 Spider photos copyright Auto Trends Magazine. All rights reserved. 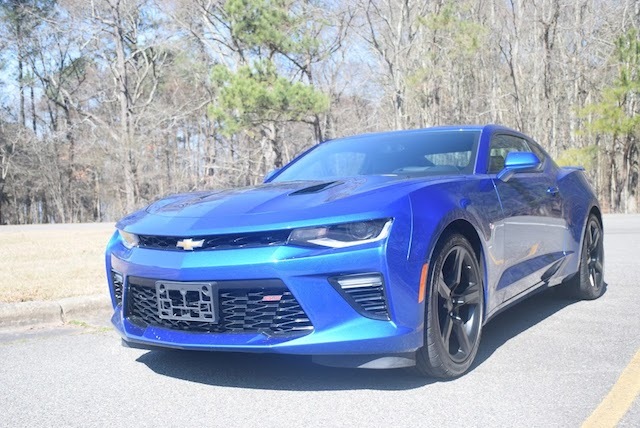 Is the Chevrolet Camaro SS a 2+2 version of the Corvette? It sure seems that way. Both models share a 6.2-liter, V-8 engine making 455 horsepower. The Camaro has an output of 455 foot-pounds of torque; the Corvette shoots out 460 foot-pounds. In the Camaro you get a 6-speed manual transmission, while the Corvette has an additional shift point. From there, the differences become more apparent as the Camaro is at least 300 pounds heavier, a foot longer and sits five inches higher than Chevrolet’s sports car. The styling separation is apparent as well, but if you were to drive both models back to back, you’d quickly note the performance levels are nearly the same. Six years after resurrecting the Camaro following an eight-year hiatus, an all-new model has taken center stage. The latest iteration shares nothing with the previous generation, except for the badging. The 2016 Camaro is based on the same platform underpinning the Cadillac ATS and comes in approximately 200 pounds lighter and four inches shorter overall than the 2015 Camaro. These changes add up to one thing: a truly fast sports coupe or muscle car delivering a blistering 0-to-60 mph time of just four seconds. Take that, Ford Mustang GT! Redoing the Camaro has come as fuel prices have fallen below $2 per gallon nearly everywhere, except in the usual overpriced areas, such as California. That being said, the Camaro was designed with higher fuel prices in mind and that’s why a 2.0-liter, turbocharged four-cylinder engine is now available, delivering 31 mpg on the highway. A 3.6-liter, V-6 is standard and now makes 335 horsepower. The test model served up was a 2016 Chevrolet Camaro SS coupe (a convertible comes later) in 2SS trim, outfitted with HID headlights with LED signature lights, LED tail lamps, and 20-inch aluminum wheels. This model also has a dual-mode exhaust system, heated leather seats, an upgraded lighting package, and a Bose premium audio system. All SS models come with a unique grille with integrated brake cooling ducts, a distinct hood with functional air vents, and a unique rear stanchion spoiler. The standard 1SS package retails for $36,300; the 2SS package starts at $41,300. Chevrolet supplied the latter, adding $3,800 worth of options. A ceramic white interior accent package ($500) was offered, providing a beautiful contrast to the Hyper Blue Metallic patina gracing the coupe’s brawny frame. Further, other interior color patterns are available, depending on the exterior color chosen. Magnetic ride control ($1,695) and a dual-mode performance exhaust system ($895) were also present. Inside, an upgraded Chevrolet MyLink telematics system with navigation ($495) and low gloss black 5-spoke 20-inch aluminum wheels ($200) rounded out the main upgrades. Chevrolet even added $15 for the front license plate bracket, bolted to the grille and unfortunately evident in some of the photos you’ll see herein. All told, the final price on the test model was $46,095 or approximately $20,000 more than the cost of the base model. From stem to stern, the 2016 Camaro exudes boldness. The front fascia has a look that is almost sinister, sporting a coming-at-you smirk designed to evoke dread in all who dare stand in its way. From the front corners across the lower profile and pushing back to the rear corners, distinctive body sculpting emphasizes the coupe’s sinuous silhouette. Rolling character lines, powerful shoulders, a distinctive rear haunch, and four quad exhaust pipes are among the other exceptional features of note. Inside, the Camaro SS offers room for four, but in reality only two will fit comfortably inside. The rear seat is mostly useless unless you and the front passenger are short and giving up legroom to accommodate the rear passengers doesn’t present a problem. Otherwise, the rear seat is best served as a supplemental storage compartment. In any event, the entire rear seat back folds down to provide access to the trunk. And you’ll savor that extra room because the trunk measures a mere 9.1 cubic feet. The front seats are comfortable and supportive as expected. Average bolstering means you won’t feel so honed in that you can’t maneuver. Likewise, you’ll have sufficient support as you navigate the twisties or take on your other on-road theatrics. Kudos to Chevrolet’s designers for keeping the rest of the interior uncomplicated. Both doors have the smallest of pockets with no room for holding drinks. The two cup holders between the seats are all you need. The dashboard offers a straightforward layout with a double-notched instrument panel shield present. Two big analog displays — tachometer and speedometer — dominate the panel, but the center digital driver information display is large too. That panel is controlled by the usual steering wheel face controls. Speaking of the steering wheel, it comes leather wrapped, stitched and perforated. Fairly tame wheel grips are present. In addition, a flat-bottomed design and SS badging are two of its other features of note. If you hate clutter, then you’ll love the Camaro’s handsome center stack. That stack is dominated by a large, color display acting as the nerve center for the audio, climate control and navigation systems. Plug in your iPhone and Apple CarPlay appears on the screen — it works as promised too: I received and sent emails with it — the software allows you to correct same before sending. As with any voice-activated system, speaking clearly helps, so don’t chew and talk — it just ain’t polite or understood! Beneath the substantial display are switches and a knob to control same. Further below that is a row of 14 switches ranging from seat heating and cooling management to climate control. Two large circular dials are at the base of the stack and go beyond what they’re intended to do: deliver air to the cabin. Indeed, they’re an engineering feat and an artistic marvel rolled into one — scroll either dial to the left and your section of the cabin is cooled. Scroll to the right and more heat is supplied. In the center of each dial is another knob to open or close the vents. Its a nifty design, meant to conserve space. Probably the most important feature in the cabin is the stick shifter itself. Or perhaps the shifter along with the three-pedal action taking place as you drive. The stick is joined by three nearby switches — traction control on/off, driving mode and the electronic parking brake. You’ll become intimately familiar with all three, if for nothing other than for different reasons. Working our way back with the switches, the parking brake is a must to engage. You might forget to leave the transmission in first gear (if you’re parked facing uphill) or in reverse (if you’re parked on a downward slope). Yes, it happened to me — the Camaro rolled when I thought the stick was engaged. Fortunately, I was still behind the wheel and took corrective action. The mode switch is where the fun begins — it is automatically set for touring, but you can also choose sport, track and a snow/ice mode. I used all four, including the last one for driving on a thinly graveled road. But the fun is everywhere else, especially in track mode as you feel the steering play tightening, sense the suspension system pulling in and enjoy quicker flicks of the transmission through the gears. The exhaust note resets to a deeper baritone too. In any mode, turn off stability control as you see fit. 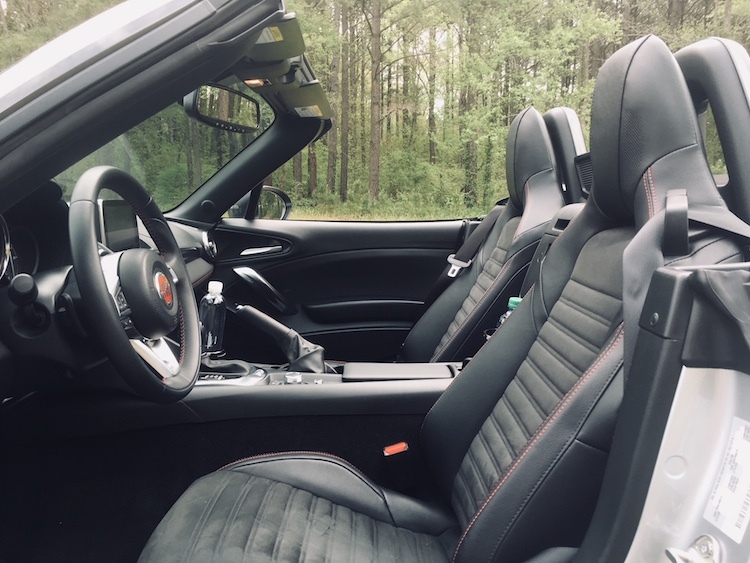 Just one more note about the interior: leather is nearly everywhere — on the seats, across the dashboard, surrounding the steering wheel and covering the door inlays. When natural light eases, the interior bedazzles as outline lights surrounding the color display as well as the door inlays switch on. You can control the color choices by way of the touchscreen to employ a riot of reds, oranges, blues and whites to correspond with your drive mode. Everything about the Camaro SS boils down to one thing: performance. This is where Chevrolet’s sports coupe nearly matches the brand’s sports car in performance. The only separation is five extra foot-pounds of torque in the Corvette Stingray and a few hundred additional pounds of body weight in the Camaro. Other than that, Chevrolet designed the Camaro to go from 0-to-60 mph in an even four seconds with the automatic transmission or just a fraction off the pace of the Corvette Stingray. Such a closeness in numbers might rile Corvette faithful, but it also allows the Camaro SS to vanquish its chief nemesis, the Ford Mustang GT. If the new and lighter frame underpinning the Camaro SS doesn’t convince you of its virtue, then the hulking V-8 should sew up the deal. Enthusiasts will want the 6-speed gearbox, what comes with a limited slip differential and active rev matching for downshifts. No doubt the 8-speed automatic will be preferred by some if only for the slight speed edge. Then again, if you’re an older driver and have tired of shifting or most of your driving is in the city, then eschewing the manual becomes more appealing. In any case, you’ll have paddle shifters to fall back on whenever a more engaged driving experience is desired. Stomp the gas pedal and your Camaro SS is gone. If you’re especially quick at shifting you’ll see 60 mph before you know it. Let’s just say I was still in third gear when I hit that all-important performance threshold with fourth gear readied for engagement. No worries about redlining — just keep shifting as fast as you can. You might also reset the instrument panel’s display before you get started to show you the g forces at work. Clutch play is clean, although I would give a slight edge to the Mustang GT in that category. As important as the powertrain is, the SS shines in the handling department. Muscle cars of yore provided excellent off-the-mark acceleration and confident braking, but came up far short in handling. The Camaro eliminates those deficiencies as it borrows some parts from Cadillac, including the CTS’ steering as well as GM’s famed magnetic ride control adaptive dampers, the first time we’ve seen the latter on the SS. Throw on the included Brembo brakes with 20-inch Goodyear Eagle tires and you’re ready for the track. Regardless of drive mode, steering is brawny, but especially so in track mode. At the same time, a quick flick of the wheel to either side moves the front wheels, imbuing driver confidence as you slice through the turns. Steering and handling is on par with anything coming out of Europe —- I put the 2016 Camaro just ahead of the Mustang GT. In fact, this model is faster than the GT, although the Shelby GT350 and Dodge Challenger SRT Hellcat are faster yet. And much more expensive too. I would be remiss if I left out one important factoid regarding the interior that has a substantial impact on the driving experience: the sight lines up front are excellent, but are awful on the sides. The smallest rear coupe windows are present, so you’ll need to lean heavily on the side mirrors to be aware of your surroundings. For some motorists driver assist features, including side blind zone alert, are a must. You’ll find it included with the top-end 2SS trim package. In summation, the current iteration of the Camaro does everything to uphold what enthusiasts want in a modern sports coupe. It also goes well beyond that by delivering a stylish, competent and thrilling model that takes no prisoners. Moreover, GM has invested heavily in advancing the Chevrolet brand in recent years and the all-new Camaro is one of its shining achievements. Chevrolet Camaro SS photos copyright Auto Trends Magazine. All rights reserved.